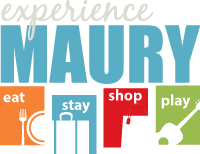 Whether you’re looking for adventure, history or live music you’ll find it in Maury County. Tour the home of the 11th President of the United States, James K. Polk. Built by his father in 1816 this historic home was the first brick residence in Columbia and has been restored to give visitors a glimpse into the past. Open for tours daily. Call or visit the web site for more information. April-October: Monday-Saturday 9 AM to 5 PM; Sunday 1-5. November-March: Monday-Saturday 9 AM to 4 PM; Sunday 1-5. Closed January 1st, Thanksgiving Day, December 24th & 25th. Built in the 1850’s and home to Major Nathaniel Cheairs. It played an active role during the Civil War for both Confederate and Union armies. Open Monday through Saturday from 10 to 4 and Sunday from 1 to 4. Call or visit the website for more information. Built circa 1835 for Samuel Polk Walker, nephew of President Polk. The home was acquired by the Reverend Frank Gillette Smith and became a private school for girls. Open Thursday- Saturday 10 to 4. Tuesday and Wednesday by appointment. Call or visit the website for more information. Elm Springs is a Greek revival mansion built in 1837 by Maury County’s master builder, Nathan Vaught. Home and gift shop open Monday through Friday, 9 to 5. Call for more information. Rediscover the history of the “Phosphate Capital of the World” in Mt. Pleasant. This small town of 466 in 1880 boomed to 2007 by 1900. Open Monday through Saturday, 10 to 4:30. Call for more information. A community kitchen with live pickin’ performances just a few feet from your seat. A live music venue featuring local bands, regional bands, performers and songwriters on stage Wednesday, Thursday, Friday and Saturday nights. The best made from scratch burgers and onion rings are a bonus. Fun for the whole family at Tenn Pin Alley includes our newly renovated Bowling Alley with Laser Tag and a Redemption Arcade. The Duck River flows through Maury County much as it did when our ancestors travelled it and is the most biologically diverse river in North America. Unlike many area rivers, the Duck is deep and quick flowing enough for experienced paddlers, but easily managed by beginners. Bring your own boat or rent one here. Maury County is fortunate to have an abundance of beautiful trails and parks with waterfalls, caves, walking, biking and hiking paths. Whether you are seeking the challenge of a 400-plus mile trek on the Natchez Trace Parkway that runs from Maury County to Natchez, Mississippi or want to take an afternoon ride through our scenic backroads, you will experience rolling hills and natural beauty that Tennessee is famous for. The Chickasaw Trace Park, an 8.5 mile mountain bike and hiking trail, is beautifully located on 300 acres of the Duck River and Knob Creek. Maury County is pleased to be a part of the South Central Tennessee GeoTour that includes 13 counties in South/Middle Tennessee! Geocaching is a free, real-world outdoor treasure hunt. Players try to locate hidden containers, called geocaches, using a smartphone or GPS and can then share their experiences online. You will find the caches hidden at historic sites, our parks and business partners in the area. Enjoy the beautiful backroads of Maury County while having an adventure! For more information on the South Central Tennessee GeoTour please visit www.sctta.net/geotours/south-central-tn-geotour.